Thanks to favorable Dutch tax laws supporting the arts, more and more people are choosing to support KUNSTENISRAËL with yearly fixed gift for five years. These gifts help provide a solid foundation for our work. 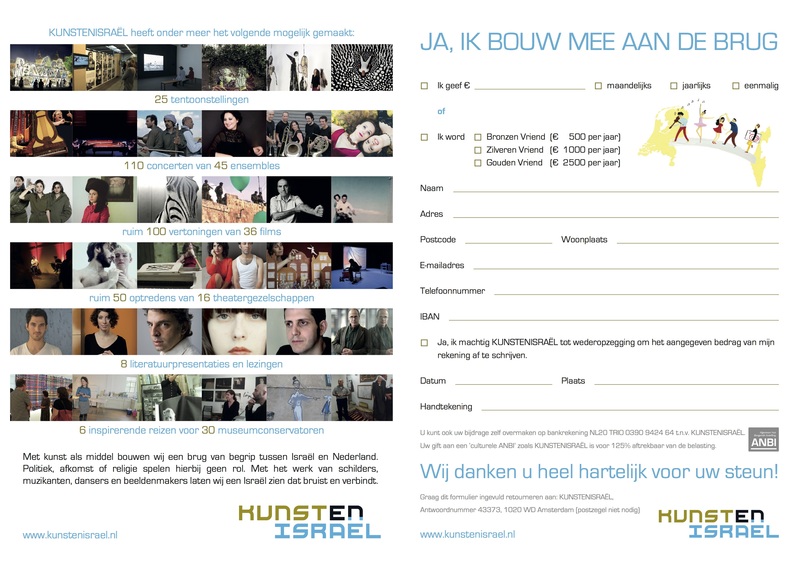 The Netherlands Foundation for Israeli Culture (KUNSTENISRAËL) is an independent non-profit organization working to support cultural projects from Israel in the Netherlands in cooperation with organizational partners. Copyright 2014 KUNSTENISRAËL, All Rights Reserved | Hollands Lof | SCEP B.V.